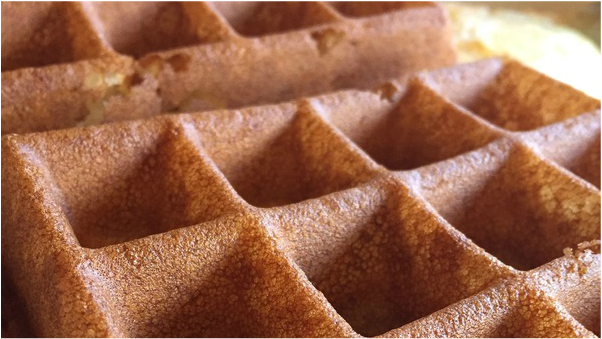 I’ll tell you what happened while you admire these delicious waffles. Friendly Neighborhood Friday went to a convention right along with my interviewee. I’m talking about Jeffery Cook, one of the authors of Working The Table, which is a book about bringing your books to conventions. I can haz ironywaffles and they are tasty! Irony. Waffles. Gah, yeah you see what I did there. Anyway, here’s something about Jeff, whose convention experience can be measured in loads (literally, as in dragging loads of books with him plus working loads of shows). Jeffrey Cook is an award-winning science fiction and fantasy author, primarily affiliated with Clockwork Dragon Books and the Writerpunk Press charity project. In addition to ten novels, four novellas, and numerous short stories, Jeffrey has published a work of non-fiction for independent authors, Working the Table: An Indie Author’s Guide to Conventions, co-written with his convention partner, author Lee French. J.C.- Among my work are charity anthologies, for which I am both a writer and an organizer, to benefit a local animal rescue and wildlife sanctuary. Specifically, we pay for a large dog kennel at the rescue in honor of my dearly departed, four-legged writing sidekick. I love animals in general — but I’m particularly a lifelong dog person.D.R.- Darts or billiards? J.C.- During high school, the more competitive pool players declared me the perfect opponent: just good enough to practice on without much fear of them actually losing, unless they made a major mistake (hence worth practicing with), and perfectly cool with losing a lot. I figured it got me a lot of free games.D.R.- Cake or pie? J.C.- Both can be wonderful, but having to choose — pie. J.C.- I moved around a lot while growing up. The one commonality between nearly everywhere I lived, though, was lots and lots of snow. Even places that aren’t particularly noted for brutal winters hit record snowfall years while I was there, by pure chance. Due to that, and experiences such as shoveling a quarter-mile long driveway multiple times over a North Idaho winter, I really do not like snow. D.R.- Tell us about your partner. J.C.- I have two people who are absolutely crucial to the general process. 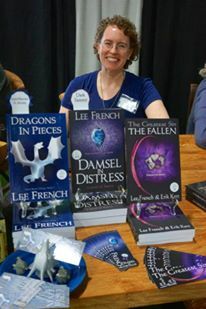 Lee French is another science fiction and fantasy author. She has 13 books out, covering genres as diverse as epic fantasy, sci-fi superheroes, cyberpunk, and YA urban fantasy. She’s also critical to success on the convention circuit, as she’s a master of set-up and tear down, very good at observing trends and what’s working for others and integrating new ideas into our table. Katherine Perkins is my editor and some-time co-author. She had some critical observations on this book, and, in general, I couldn’t operate without her. 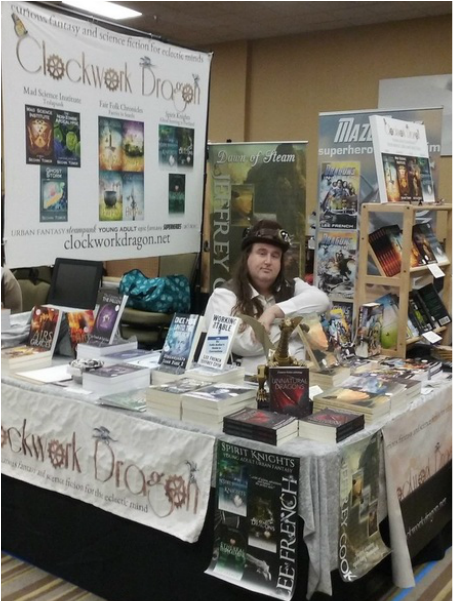 D.R.- Where’d you get the idea for your book, Working the Table: An Indie Author’s Guide to Conventions? J.C.- Lee and I have worked close to 50 conventions together now. After the first dozen or so, we started having people who watched us set up, work together to sell books, etc. suggest that we should write a book about it. For quite some time, we laughed at the suggestions. Eventually, another author insisted she was very serious, and we should do it, or she might try her hand at it. We laughed it off again that time — but it got my brain going. That night, staying on a hostess’s floor at her apartment, I couldn’t sleep. Eventually, I stayed up until 3:30 writing down outline ideas. I didn’t know it, but Lee had a similar situation, but in her case, it led to her waking up at 4:30. We compared notes on the drive home from Portland and finally decided that, yes, we had to do this. Ultimately, it does come from having a lot of experience — and a lot of learning experiences to share — and other authors telling us that those would be valuable things to share. J.C.- I think Working the Table is potentially valuable for pretty much anyone intending to take their books to live events (and probably other sorts of vendors as well.) We’ve had positive feedback from romance writers, non-fiction authors, literary fiction authors, etc., along with people in our usual sci-fi/fantasy circles. J.C.- Working the Table is, we hope, a valuable guide to anyone who has one or more books published, and either is thinking about venturing out into the world of doing signings, fairs, conventions, and other events where they’ll be interacting with, and selling to the public, or who is already doing so, but uncomfortable with the experience. There’s help for what to bring to set up a table, what to be prepared for, what book pitches you need to devise, sales approaches, and more. D.R.- Do you do live events? Where and when? J.C.- That’s part of the point, of course. Lee and I maintain an active and mostly successful convention schedule. We primarily attend shows in the Pacific Northwest, in the Seattle-to-Portland corridor, but conduct a couple of road trips each year. This year, between us, we covered 32 events. Next year, we’re scaling back to about 18 or so. We’ll definitely hit a lot of the major conventions around Seattle and Portland and will also be at GenCon for certain, and a few other events outside our area, specifics to be determined. J.C.- Working the Table can be found on Amazon. Our convention schedule of live events can be found at Clockwork Dragon. Here is my personal web site.